Some of you might remember my project to bring my Amiga 500 back from the shadows. If not, then you can find the previous posts here (part one) and here (part two). Sadly, this project has now come to end, but not a happy one I’m afraid. When I tried hooking up my Amiga 500 today to play around with my KCS Power PC Board (hardware PC-emulator), the floppy disk drive refused to work. Keep in mind that this is a new drive bought from Vesalia and that I know it’s working properly. I opened up the machine and had a look, but couldn’t find anything indicating any problems. When I tried starting up the machine a second time, there was some weird high-frequency sounds coming from it and I became afraid that it would start to burn or something similar. I also felt some kind of strange odour omitting from it as well. Turns out the machine just died. 😦 It’s not working anymore and I can’t understand why. It’s very sad and I now how to bury my old and trusty Amiga 500, so that it can rest in peace. I won’t buy a new one, as it won’t be the same. Already got an Amiga 1200 and a CD32, so I don’t have any urgent need to replace it. Goodbye my Amiga 500! Thanks for all the fun! 🙂 You were brought back from the shadows and entered the light.. have a good time in Amiga heaven! Previous MAS Player Evolution: MP3’s on the Amiga! Next Amiga Future: Issue 95 is out now! I think a moment of silence is in order. That is a sad story, I feel like listening to some Chopin as I read it. How will she end? a Viking burial? a shine? buried at sea? a coffee table? I might be interested in doing a trade with you. I’ll send you a PM on AmiBay soon. Thanks, Draxx. 🙂 I’ll send you a new PM with price of postage. Sounds good. 🙂 Thanks for the trade! Wow! That was fast indeed! 🙂 Kudos to the Postal Service for such a quick delivery. Good luck with the board – hope you’ll have fun with it! Back in the 90’s I was reading a Greek computer magazine called Pixel. There was a review for Shadow of the Beast 2 and it was mentioned about a VHS showing an IBM 386 that was helping making the game. *cries* “wipes tears”…. Sorry about your loss bro…. Amiga is awesome, it’s not like PC when they screw up you just go get another, but with Amiga it is like a part of you. I have 2 Amiga 500’s in great condition with no yellowing of the keys whatsoever which I am glad to show them to you, see below. This is my as new mint condition German version Amiga, you will notice the Z and Y keys are swapped, but that is the german layout. Still has the original seal underneath and never had the case off. This is now tucked away and has been plastic sealed myself to protect it. Wow! So many systems! Please keep me posted! Thanks! What about, “A500+/A1500/A2500”. Don’t forget these other three!!! Amiga Forever!!! Thanks mate. 🙂 Hope your machine still works and that it is ready for action. The A3000 has 16MB of ZIP RAM in it, a A3640 68040@25Mhz, and a 4GB SCSI drive. The A2000 has a 68020 and 8MB RAM and 1GB drive from memory (it’s been in storage for a while now). The A1000 is expanded to 512K and it’s pretty much in mint condition! 1 of my CD32’s has an SX32 module (not the pro unfortunately) and the other has an SX-1. My A600 has 4MB Fast RAM expansion also, with a Squirrel SCSI PCMCIA card, and 4GB CF drive. All 3 A500’s have A590’s with 2MB RAM loaded, with varying size drives. One of the A500’s has a 68010 CPU too..
I’m impressed with the specs of your machines. Especially the CD32. Would love to own one of those SX32 beauties.. they truly transform the CD32 to a gaming power-house. They are incredibly expensive though, so I don’t think I’ll afford one for a long time. The Squirrel SCSI is a nice piece of hardware. Excellent for connecting CD-ROM drives and the likes. Used to have one myself, but that’s a long time ago now. We accompany you on the feeling. RIP A500. Just recieved today a mint condition floppy drive for my A500, and also 2x brand new Amiga mousies never used, I have one already in mint condition and still works like new, but I got these as back ups and to know they are new I may not even use these but just to kepp and store away, if I see more I may grab them…. Zro Dfects.. . 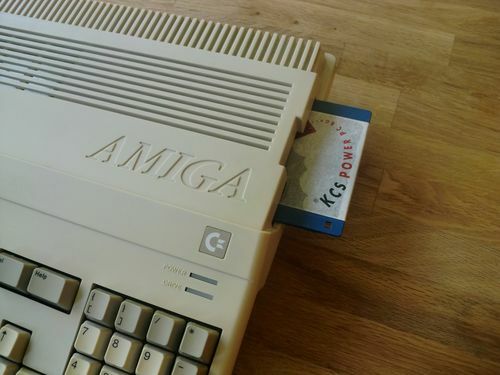 True Amiga fan..
Jay Miner is god of Amiga, I am god of loving the Amiga :)……. That’s good news. 🙂 The stuff is in perfect condition! Thanks for sharing! Nice slogan you’ve got there. 😉 Thumbs up! All this talk about Amiga is awesome, it feels like late 80’s all over again lol, the only machine in the world that continues on with the same fun and awesomeness as day one. When I had my original A500 the floppy drive stuffed up around year 2000-ish, since Amiga was not around much then well to my knowledge anyways I got rid of it because I knew I couldn’t sell it, I also had 4x triple disk boxes, 2x twin disk boxes and a single disk box full of games and programs etc and I was in heaven. Now this may hurt some and it for sure hurts me too which I am kicking myself today that I actually threw all those disks in the bin, I know I know I can hear the screams, as then I thought it was kinda over and not long after I felt there was something missing, a part of me that was gone and I realised it was the Amiga, so I ended up getting a couple of machines incase it does stop working again etc which I then will have backups to use. It was not long after I knew about the Amiga Emulator for the PC, I thought aweseme I can collect all the games I had back then, and it has been great but there was still just a little something I was still missing while I was staring at my Amiga doing nothing while I was playing Amiga games on the PC emulator, I felt bad and now I play Amiga games on my Amiga they way life should be, I prefer the real hardware anyways. So I am now collecting stuff all over again everywhere for my sweet darling Amiga *kisses* no one saw that right ? lol, anyways, so you already saw the photo of the floppy drive I posted recently, well I just bought another one also in mint condition. I also bought another bundle of magazine floppy disks, as you know last time it turned out into a big mess of the 262 disks I got last time which mostly were magazine demo disks only to find out they were all blank, out of those 262 disks I was able to get a copy of AMOS – The creator, and the original disks to Operation Stealth game, so now I have a whole pile of blank disks, about 70 of them I think are for the A1200 which I plan to get later, so with luck there may be stuff on them, there was however some original disks of Deluxe Paint 4 AGA but I am not holding my breath that they are still on the disk but won’t know until I get the A1200, wish me luck :P.
The seller was sure that the original data are still on there, i also do know there is one label that is ripped and the rest look ok, there are also a couple of duplicates, not sure whether to sell these or to keep them as spares, I most likely keep them as spares since floppy disks will be harder and harder to get hold of over time…. If you were in my neighbourhood – you could have popped it round – as I’d have been happy to see if the hurdle could be resolved. Seems a shame for your focused effort to end on an unfortunate note. Regards. Here is a photo of the disks here, there are the odd 1 or 2 that are A1200 only but the rest are A500 onwards…. That’s a nice collection of cover disks! Lot’s of cool stuff there. I’ve got a few of those myself. I remember fondly the one with the game Trick or Treat, as that was fun in multiplayer. Amiga Power did always provide good cover disks with their magazines. Also liked reading the mag – loved the humour of the writers. 😀 I also think their game reviews were pretty honest when compared to some other mags. If a game was crap, Amiga Power told you it was bad. Do you have many Amiga Power mags as well? Yeah Amiga magazines you could actually trust their judgment on games compared to for example playstation or xbox magazine, sometimes a game will have a pretty good rating then you go ahead and buy it and turned out to be one of the worst games you have ever played where as Amiga magazine you could go and grab any game they claim to be worth getting. I don’t have any Amiga magazines yet but I don have my eye on a few at the moment.. But I will for sure grab some…. Hope you’ll get hold of some Amiga mags in the future. They are still an interesting read today, as it often happens that one discovers a new game, a cool utility or some neat hardware. 🙂 Speaking of hardware.. I was surprised to learn the variety of hardware PC emulators for the Amiga. Amazing stuff. Spot on with the write-up, I really think this excellent website is fantastic. I will be back again to see more, many thanks for that info.